A rare first edition of Le Corbusier's 1931 interactive design guide Polychromie Architecturale: Die Farbenklaviaturen is up for auction in New York. The book – which was created for Swiss wallpaper manufacturer Salubra – features pop-up and pull-out sections, based on the architect's approach to colour. 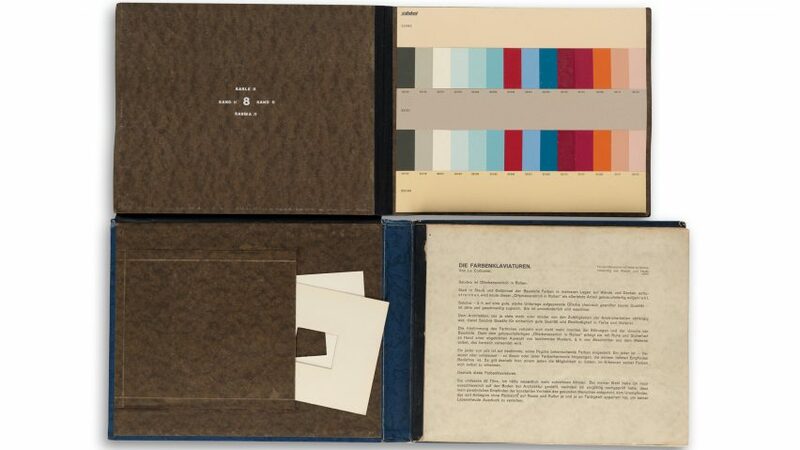 Auctioned by New York's Swann Auction Galleries, the guide includes pockets with wallpaper samples and 12 pages dedicated to colour scales – complete with a paper slider. The architect started developing colour systems in the 1920s, creating a "colour keyboard" intended to help users find and match colours for use in interiors. Le Corbusier believed that specific shades could affect rooms and their inhabitants, creating a welcoming atmosphere or altering their perception of space. He identified functions that could be applied to different shades – including psychological effects, weight, depth, perception and unity – and then chose groups of colours to attribute to each of these. Paler colours with natural pigments could be used to create warmth and light, while deeper shades could enhance or camouflage elements in a room. He believed synthetic pigments had a more invigorating effect, and would have a dramatic influence on architecture. Le Corbusier created several wallpapers for Salubra according to his theories. The first featured plain colours and the second included designs with large geometric shapes that could be hung to create patterns. His Die Farbenklaviaturen is expected to sell for somewhere between $2,500 and $3,500 (£2,000 and £2,800) at Swann Auction Galleries' Art, Press and Illustrated Books sale on 1 December. Interest in the French-Swiss architect shows no sign of waning, with UNESCO adding 17 of his projects to its list of internationally significant architecture sites this year. His work is also being rediscovered, with photographer Benjamin Hosking shedding new light on Le Corbusier's Chandigarh government buildings with a set of new images and lighting firm Nemo reissuing a cement lamp created by the architect to illuminate walkways at his Unité d'habitation de Marseille.